AMD kicked off the Consumer Electronics Show in Las Vegas to go over their roadmap plans for 2018 and it looks pretty good. 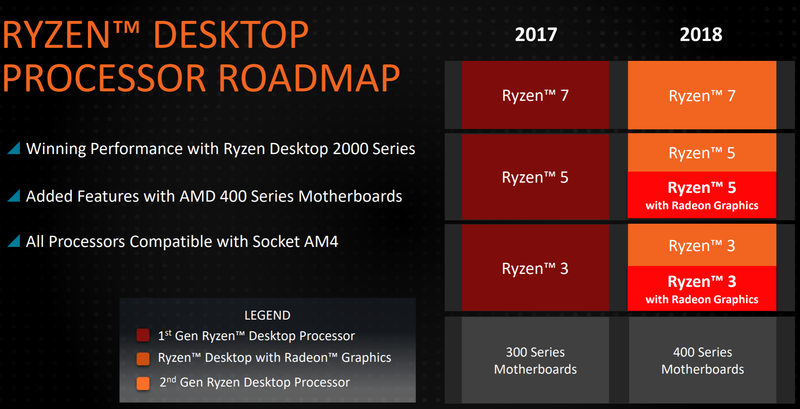 AMD will be releasing a number of desktop Ryzen processors along with Ryzen mobile APUs. AMD will be starting off by launching Ryzen 3 models on January 9th, 2018. 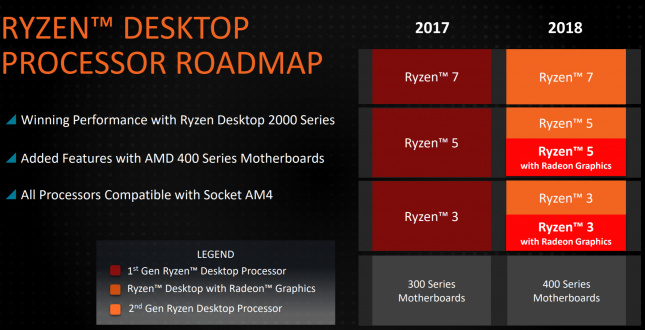 The company will then be launching Ryzen Desktop APUs on February 12th and following that up with Ryzen 2nd Generation CPUs in April 2012 and Ryzen Pro mobile APUs just after that. Looking at the second half of the year we’ll be seeing 2nd generation Ryzen Threadripper processors and Ryzen Pro processors being released. 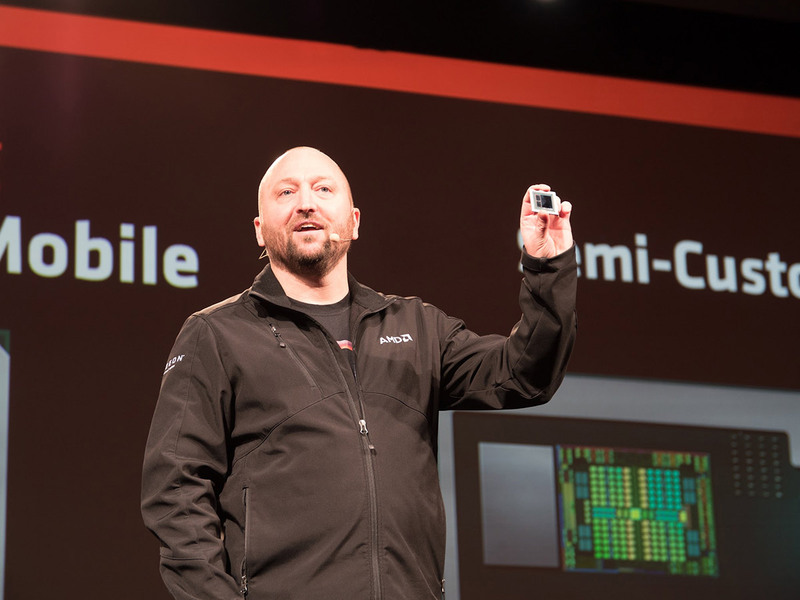 First up on January 9th, 2018 AMD will be introducing two new mobile parts that are aimed at being more affordable and will help AMD get into more thin-and-light devices. The AMD Ryzen 3 2300U is a 4-core, 4-thread part with a 2.0 GHz base clock and 6 CUs. The Ryzen 3 2200U is a 2-core, 4-thread part with a 2.5 GHz base clock and just 3 CUs. Both boost up to 3.4 GHz and should be disruptive in the 15W SoC market. On February 12th, 2018 we’ll see the release of the AMD Ryzen 3 2200G for $99 and the Ryzen 5 2400G for $169. These will be the first Ryzen desktop processors with Radeon Vega graphics. For $99 you can get a quad-core processor with a 3.5 GHz base clock and 3.7 GHz boost clock with 8 compute units. If you wanted something a little more powerful you can move up to the Ryzen 5 2400G that has 4-cores, 8-threads running at 3.6 GHz base and 3.9 GHz boost with 11 compute units for $169. 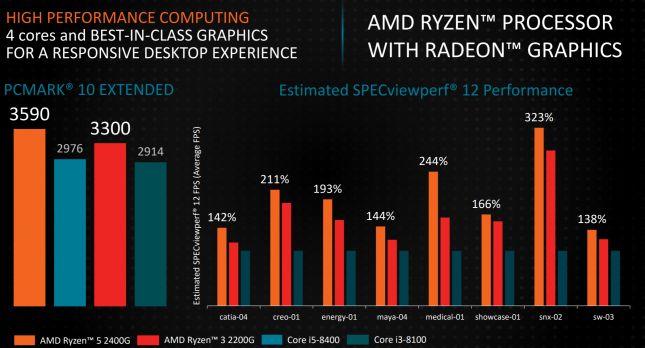 AMD’s testing shows that the performance is very good as the AMD Ryzen 5 2400G easily outperforms the AMD Ryzen 5 1400 in many popular benchmarks as you can see in the chart below. When compared against the Intel Core i3-8100 and Intel Core i5-8400 on SPECviewperf 12 we again see AMD taking the lead. the Ryzen 3 2200G performs better than the Core i3-8100 and the AMD Ryzen 5 2400G performs better than the Core i5-8400U. AMD took a look at sub $200 processors and used the Cinebench R15 multi-threaded CPU benchmark to show performance leadership against Intel. 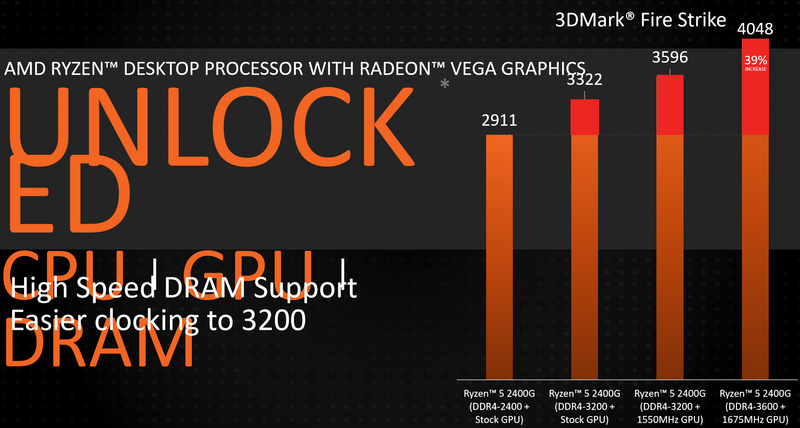 We should also mention that the AMD Ryzen processors with Vega RX graphics are fully unlocked on the CPU, GPU and DRAM. AMD was able to overclock the stock GPU on the Ryzen 5 2400G from 1140 MHz all they way up to 1675 MHz on air nearly a 40% performance gain in 3DMark Firestrike. With LN2 cooing they were able to get the Ryzen GPU up to 2GHz! 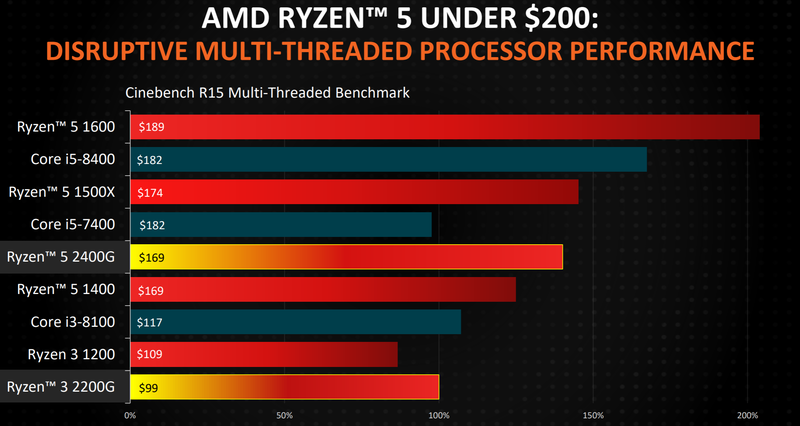 Notice that they were running the memory at 3600MHz on the Ryzen 5 2400G, so these look like they’ll be fun chips to overclock. AMD Ryzen processors with Radeon Vega graphics will slide right into the roadmap and work on existing 300 series motherboards after a UEFI / BIOS update as well as upcoming AMD 400 series motherboards. Since we mentioned the AMD 400 chipset series, we should point out that those new boards will be coming in April 2018. They have some minor refinements and use less power. 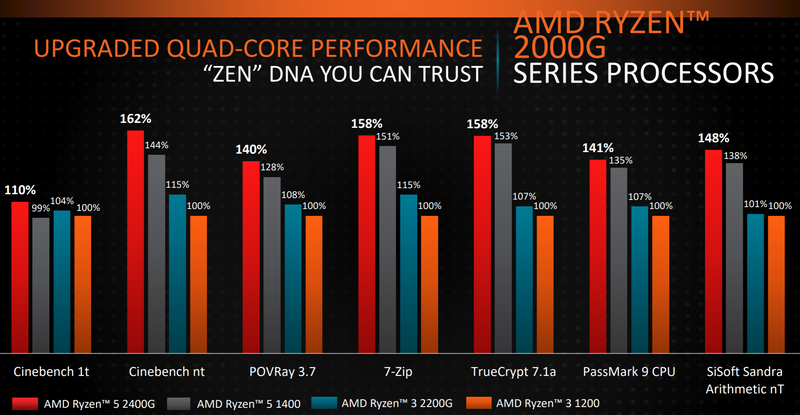 They will be coming out alongside the 2nd Generation Ryzen desktop processors that have 12nm Zen+ processors cores. 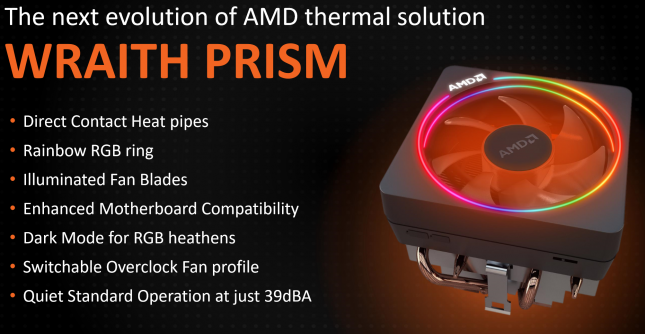 With the die shrink and refinements, AMD has been able to get higher clock speeds! These new AM4 desktop processors also feature Precision Boost 2 technology. The other big processor news is that AMD is immediately cutting the price on some AMD Ryzen processors. The AMD Ryzen 7 1800X cost $499 at launch, but can now be purchased for just $349. The Ryzen 7 1700X has been reduced by $90 down to $309 and the Ryzen 7 1700 has been slashed to $299. 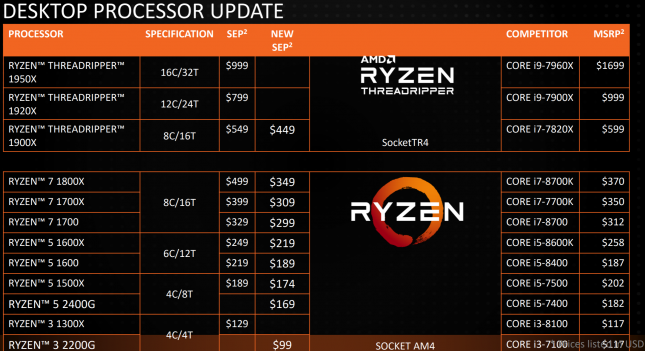 All Ryzen 5 prices have been reduced and on the top of the stack the Ryzen Threadripper 1900X gets a $100 price cut. 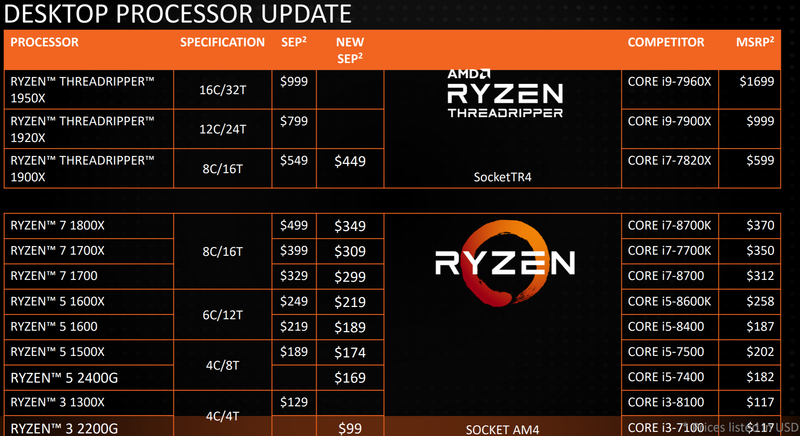 The AMD Ryzen Threadripper 1950X and 1920X has not had prices reduced as they are doing well against the Intel Core i9 series from what we gather. These lower prices should get the attention of Intel and will likely get some folks to purchase an AMD processor. 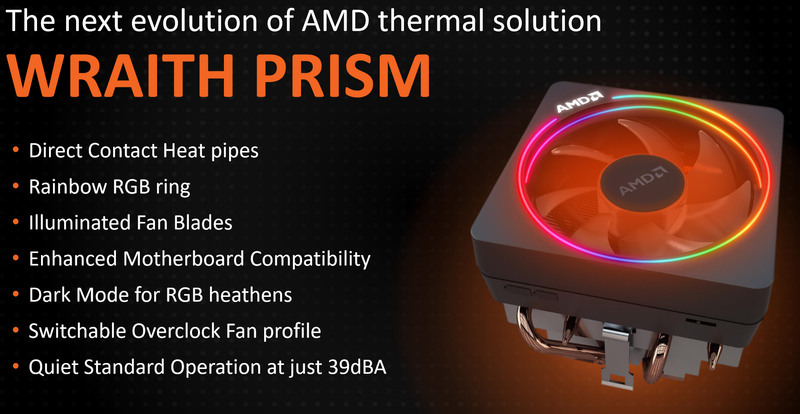 AMD will also be releasing a new Wraith Prism CPU cooler with will be available by itself for around $49. It has a physical switch on it that allows you to switch between fan and RGB lighting profiles. The direct contact heat-pipes and fan should keep any Ryzen CPU nice and cool with sub 40dBA noise levels. 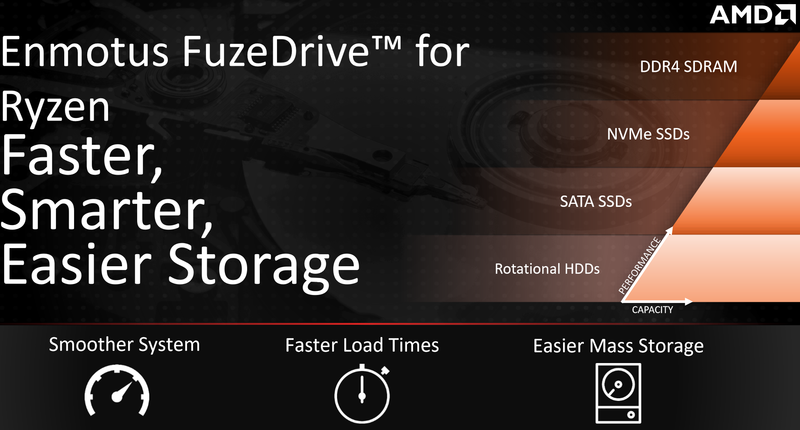 For around $20 AMD will also be offering a utility called Enmotus FuzeDrive for AM4 platforms that will allow to improve storage performance. 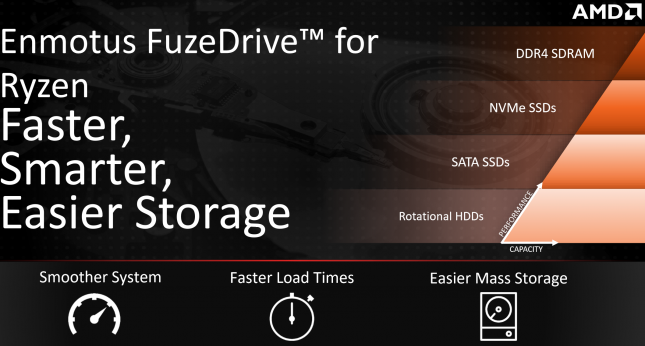 This is aimed at users that have hard drives for mass storage and is basically a tiered caching utility to enhance storage performance. The Enmotus software dynamically allocates the storage resources to optimize performance. AMD also gave us a glimpse on what they are working on beyond 2018 and it looks good. You have Zen+ on 12nm coming in April and then you’ll have that followed up by Zen 2 at 7nm sometime in 2019. AMD says that the Zen 2 design has been completed and it should be headed to tape out soon. Way down the roadmap in 2020 we might see Zen 3 come out on 7nm+ if everything goes as planned. AMD looks like they have no plans on slowing down and appear to have a solid CPU roadmap for the next several years!